// Next, handle the case where the user canceled the operation. // Note that due to a race condition in the DoWork event handler, the Cancelled flag may not have been set, even though CancelAsync was called. // Finally, handle the case where the operation succeeded. // This event handler is where the actual,potentially time-consuming work is done. // Assign the result of the computation to the Result property of the DoWorkEventArgs object. This is will be available to the RunWorkerCompleted eventhandler. // This is the method that does the actual work. 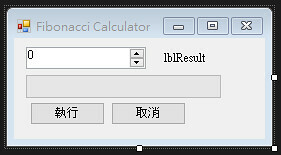 For this example, it computes a Fibonacci number and reports progress as it does its work. // Disable the UpDown control until the asynchronous operation is done. // Disable the Start button until the asynchronous operation is done. // Enable the Cancel button while the asynchronous operation runs. Abort the operation if the user has canceled. Note that a call to CancelAsync may have set CancellationPending to true just after the last invocation of this method exits, so this code will not have the opportunity to set the DoWorkEventArgs.Cancel flag to true. This means that RunWorkerCompletedEventArgs.Cancelled will not be set to true in your RunWorkerCompleted event handler. This is a race condition.